On the lookout for the perfect dessert to bring for Thanksgiving dinner or a deliciously sweet treat to impress an important date? Then a cherry cheesecake is your answer. This simple yet intricately flavorful cheesecake is terrific for both a large family lunch festival along with a romantic dinner, especially with a light sparkling wine. And no, forget about buying the cherry cheesecake. Why not make one instead? 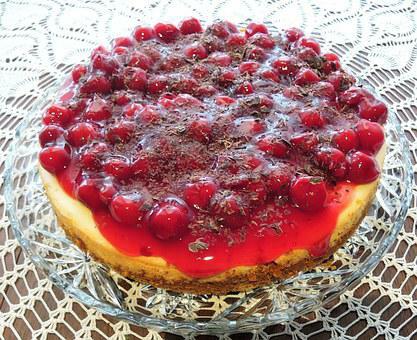 With the right tools and this easy how-to, you will be able to put together a scrumptious cherry cheesecake very quickly. For the crust, you will require a cup of graham cracker crumbs, sugar (about three to four tablespoons is enough), and some melted butter. You will also need about fifteen ounces of chilled, cherry pie-filling, sugar, and vanilla extract. Now that you have all the ingredients on hand, you can begin with making the crust. Mix together the graham cracker crumbs, the melted butter and the sugar, and then force down the mixture into the base of a spring-form pan. Pop this in the oven and bake it at about 350 degrees for ten to twelve minutes. While baking, go right on to making the cake. It’s a good idea to use an electric mixer to blend together the cream cheese, the eggs (remember to drop them in one by one), then the sugar and vanilla. Once you get a firm consistency, then bake it at about 450 degrees for ten minutes. Then, adjust the temperature to approximately 25 degrees lower and proceed on baking for another twenty five minutes. You can then carefully take the cake off the pan and let the cake cool. Pop it in the fridge overnight (or for at least nine to twelve hours). Finally, liberally spread the cherry filling over the cake.